This wedding photograph of 3597882 Private Hugh McGuinness, 1st Battalion The Border Regiment and his bride, the former Miss Irene Hollman of Whitehaven, Cumberland (now Cumbria) was taken on 29 December 1945. It is used with the permission of the McGuinness family. During the Second World War Hugh McGuinness served firstly with the 5th Battalion (T.A.) The Border Regiment before transferring to the 1st Battalion which became part of the Airborne Division. In September 1944 - towards the end of the Battle of Arnhem - Regimental records show that Hugh McGuinness was among the last troops to surrender. His platoon only did so when ordered to do so after virtually everyone else capable of doing so had withdrawn. Virtually everyone else who remained was dead, dying, wounded or those caring for them. For the remainder of the war, Hugh was a Prisoner of War. For a time, Hugh’s sweetheart, family and friends did not know what had happened to him. As this photograph proves Hugh’s wartime story had a happy ending. Like many other servicemen and women, after the war Hugh McGuinness rarely spoke to his family and friends about his wartime experiences. However, at the request of his C.O., Hugh McGuinness did leave an account in his own words about the final surrender of the Allied bridgehead of Operation Market Garden. This can now be found in the Border Regiment and KORBR Museum at Carlisle, Cumbria. For further details about 1st Border in Operation Market Garden and Hugh’s account of the final surrender click on ‘Comments’ below. There appears to be a leaque table for just about every eventuality to-day, and I was just reflecting on some of the choices that our Generals had when it came to deciding which Division should lead the next attack... many of the choices were easy - particularly Africa and Italy...where 4th Indian stood above the crowd followed by 9th Australian - 2nd New Zealand - 50th British - 7th Armoured - 2nd Polish - 78th British - 1st Canadian - 51st Highland - 8th Indian. All the rest were reserves in most cases with the Armoured Divisions being low on the totem pole. From a thread on the BBC WW2 People's War Message Board it would appear that there is some confusion as to what guns were used and which formations used them. I shall exclude anti-aircraft artillery (the HAA in fact had lighter guns than Medium Regiments) and the self-propelled guns of the Royal Horse Artillery. The main artillery support at divisional level was the field regiment mostly equipped with 25 pdr guns towed by 4×4 'Quad' motorised tractors with separate ammunition limbers. Field regiments were organised into three eight-gun batteries, each of two four-gun troops. Next up were the Mediums. All Medium Regiments and Medium Batteries were Corps artillery. Initially the gun was the 6 inch howitzer, replaced in 1942 by the 5.5 inch howitzer. Their firepower could be superimposed on any divisional field fireplan. I have not been able to locate a photo of the 5.5 inch on the Internet, so I have scanned a couple I have. 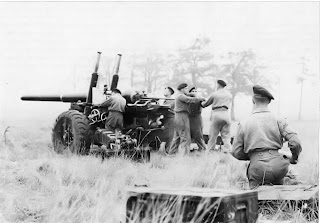 This is a BL 5.5 inch Mk 3 gun being loaded. The shell is being rammed in. Rammers always face away from the breech and are guided by the NCO in front. To the right, behind the rammers, the breech operator is re-loading the firing lock and to the left the gun layer is lining up the gun sights. The sergeant in the foreground is dashing forward with the cartridge which will be fitted to the shell, having ensured that the correct amount of propellant is in the cartridge. Given the calm demeanour this is possibly a training session. 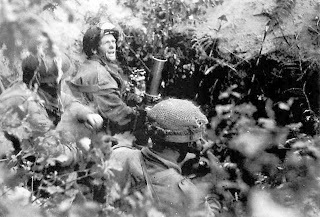 This dramatic shot shows a gun-crew in action in battle. 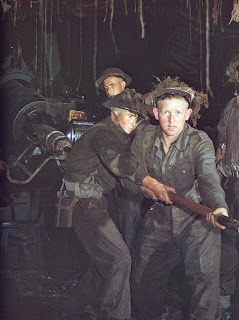 Note the tenseness of these young gunners and the concentration on the breech operator's face. Once the gun starts firing its position is revealed and the gun cannot be moved, come what may, and it will, they have to keep on firing. Next up were the heavies (Hy) and superheavy (Superhy) formations. These were either Corps or Army artillery. The Heavy Regiments RA were equipped with the 7.2 inch howitzer, the 9.2 inch howitzer, and the 9.2 inch gun. By 1944 half of the heavy batteries in 21st Army Group were equipped with American 155mm guns, a truly mighty weapon. A Canadian website here explains this more fully. The organization of British artillery was exactly the same, including Mike, Uncle, and Victor target procedures. 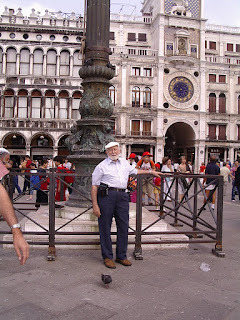 In May this year (2007) I returned to Trieste after a gap of sixty-one years. I took the opportunity to visit a well known landmark, the Piazza Goldoni steps above the tunnel and took another picture at the identical spot to the one in my Army Album. 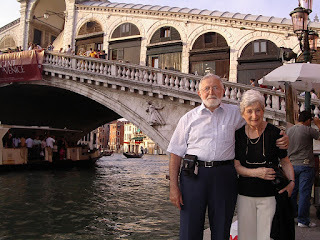 Finally, someone kindly snapped us at the Rialto bridge and when I got home I discovered that it was the same spot at which my dear friend Eddie Patman and I had posed at so many years before. Spike’s problems reminded me of an Infantry type who was occupying the bed next to mine at the Gen. Hospital at Bari which I now understand was the British 98th General. He had been shot in the leg which was now fully recovered but he was claiming that something was still wrong – and didn’t feel right . So every morning during rounds, three doctors and two nurses would descend on him and a very sharp needle would be pushed into the back of his knee cap - not once but three or four times – without a flicker from the patient. After some ten days of this it was decided that indeed there was something amiss with his leg – and he was due for Blighty – as I was – and so jollifications were called for. As we were once more in adjoining beds on the Hospital Ship , which was well on it’s way – I asked him how his leg was – his reply stunned me – “ there’s bugger all wrong with it but there was no way I was going back up that line !” We both roared with laughter as he had beaten the odds – my laughter turned almost to tears when I was hauled off the ship at Catania for skin grafts as we were running out of manpower at that time and it was case of “patch ‘em and match ‘em - and bang ‘em back up the line ! My friend sailed on to Blighty ! 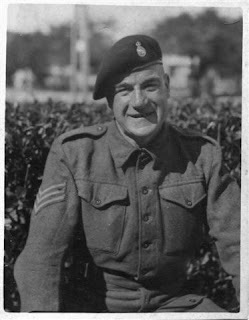 The above photograph shows Sergeant Pat McGuinness, 7th Queen's Own Hussars. 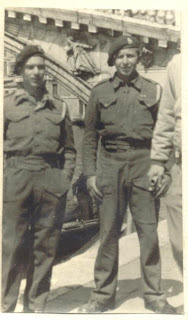 It was taken on 4 February 1944 at Netanya, Middle East (Palestine). In 2007 this photograph of Sergeant Pat McGuinness was sent to me by Mrs Monica Dalby to pass on to Pat's family in Whitehaven, Cumbria on behalf of her Dad, Sergeant Eddie 'Taffy' Morgan. 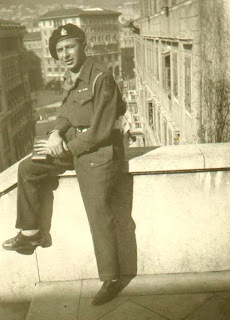 'Taffy' had served with Pat in the 7th QOH in the Middle East and Italy during WW2. Pat's relatives have hardly any photographs of him so 'Taffy' and Monica sending this photograph means they now have something else to remember him. 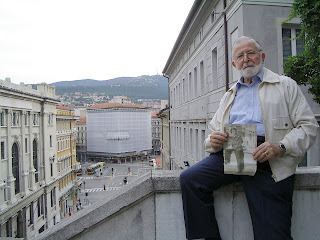 Pat McGuinness, who saw wartime service firstly with the 5th Battalion (T.A.) The Border Regiment and then the 7th Queen's Own Hussars (Royal Armoured Corps). Pat McGuinness lost his life on 17 July 1944 during the Battle for Ancona, Italy. He is buried in the Ancona War Graves Cemetery [Grave reference: Plot No IV. H. 19]. Subsequently, I have been able to speak to 'Taffy' on the telephone. Taffy has also spoken to one of Pat's daughter's Mrs Frances McAlone about her father, which was much appreciated. 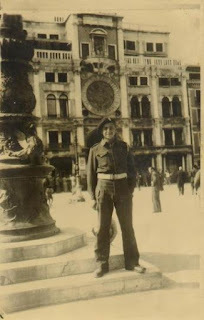 Taffy's daughter, Monica, has kindly written down his memories about the action at Ancona in which Pat lost his life and has given permission that it can be included in this article. To read this account, please click on 'Comments' below. The photograph shown above was taken outside the Church of the Nativity at Bethlehem, Middle East on 25 November 1945. The soldier standing 5th from the left on the back row is Corporal Jim 'Marra' McGuinness MM from Whitehaven, Cumberland (now Cumbria). For a previous account I posted to the BBC "People's War" website about Jim McGuinness MM click here. Although at the time of psoting this photograph I do not know the names of any of the others on this photograph I believe at least some of them served, like Jim McGuinness MM, in the 6th Airborne Division during WW2. In 1945 after the end of WW2 I understand the 6th Airborne Division were posted to what was then known as Palestine in the Middle East. The soldiers in the photograph appear to be on leave and visiting some of the religious sites in the area. I have given a copy of the photograph to the local secretary of the Parachute Regiment to see if anyone else can be identified. The Church of the Nativity at Bethlehem is on the traditional birthplace of Jesus Christ. The small entrance on the left of the photograph is the main entrance used by people entering the church from Manger Square.